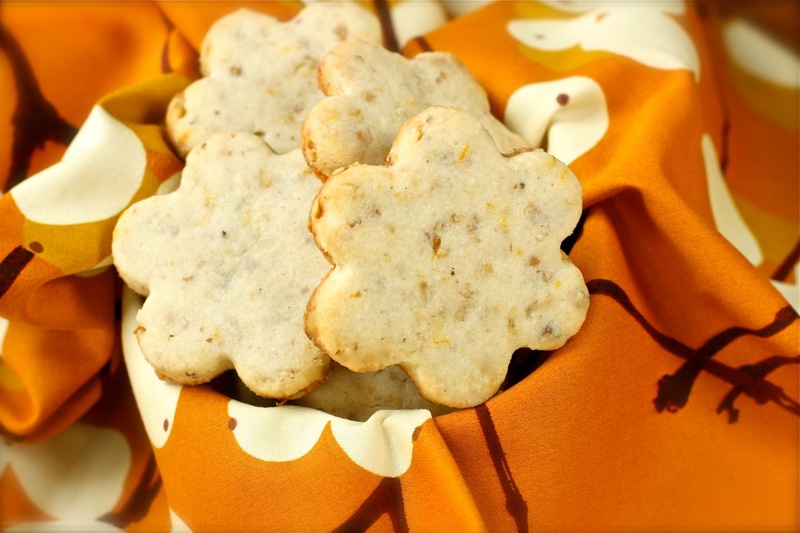 If you’re looking for buttery, melt-in-your-mouth cookies with a nutty crunch, look no further than these cream cheese shortbread cookies flavored with toasted walnuts and orange. The addition of cream cheese transforms these from the traditional sandy and crumbly shortbread to lighter, softer cookies. For an even more cake-like texture, roll the dough into balls instead of using a cookie cutter. The orange zest and extract add a welcome citrus flavor that complements the cream cheese very well. Plus, I love the way the flecks of zest dot the cookies. (I am obsessed with orange zest in cookies. It’s kinda my thing!) For even more decadence, roll out the dough into 1/8-inch thickness and spread fig jam or dulce de leche spread in between two cookies. These light shortbread are perfect to serve at a wedding or baby shower, afternoon tea, or to exchange at a Holiday Cookie party. Heat the oven to 350 degrees F. Line a baking sheet with Silpat (silicone baking mat) or parchment paper. Set aside. Toast walnuts on a baking sheet for about 8 minutes. Set aside to cool. When walnuts are cool enough to handle, coarsely chop with a knife or pulse in a food processor 2 or 3 times. In a medium bowl, whisk the flour and salt together. Add the chopped walnuts, and stir to combine. Set aside. In the bowl of stand mixer fitted with the paddle attachment, beat the butter, cream cheese, sugar, and orange zest on medium speed until the mixture is light yellow and fluffy, about 3 minutes, scraping down the sides of the bowl, if needed. Add the vanilla extract and the orange extract, if using, and beat on medium speed for 1 minute. Reduce the speed to low, add the flour mixture, and beat just until mixed. If needed, continue mixing with a spatula until all the flour is incorporated. Do not overmix. Wrap the dough in plastic wrap and refrigerate for at least 30 minutes, or until dough is firm. Remove from the refrigerator and place dough on a lightly floured surface and roll to 1/4-inch thickness. Cut with desired cookie cutter. Place on prepared baking sheet, 1-inch apart. If the dough gets sticky or too soft to roll, chill in the refrigerator until it firms up again. Bake the cookies until they are light brown around the edges, about 10 to 14 minutes, depending on the shape and/or thickness of cookie dough. Transfer the cookies to a wire rack and let cool. Err, crumbly-turns-to-sand-on-your-tongue shortbread FAN* — I am definitely not a cookie. Haha! Christine! Great to hear from you!! I’ve missed you and your blog. You were always an inspiration to me. I always looked forward to all your lovely creations! I hope your career in pastry is going well. BTW, I’d love to have your passionfruit cupcake recipe. I didn’t keep the recipe as I linked to your blog. Any way you can send the recipe to me? I still get so many hits on my blog from people trying to find the recipe. These are so pretty! I love orange zest in cookies, cakes, you name it…. These look great and I be they are delicious! I must try to make them!! Thanks, Reyna! I hope you like them. We finished the batch I made and towards the end we were making cookie sandwiches with them with some homemade dulce de leche (sweetened condensed milk simmered in water for a few hours). So good! Shortbread cookies are one of my favorite desserts. These look just divine. Cream cheese in shorbread? Very novel, for us Scots at least. Must try these. Thanks! Thanks for visiting! These are new for me as well. The cream cheese really makes these cookies rich, and smooth. These look and sound delicious Daisy! !